In an effort to deter cell phone usage while driving, New York State Police are using newer and more effective methods to catch distracted drivers, including designated patrol cars, periodic texting ticket blitzes, and enforcement initiatives like Operation Hang Up. However, even with these efforts cell phone usage and texting while driving are still big problems on the road, with many traffic accidents occurring directly or indirectly the result of a driver talking or texting. In addition, people often think they are following the rules for cell phone usage when they are actually not in conformity with the law. 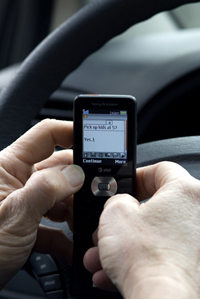 Read on for information on four common myths about distracted driving laws. Either they don\’t see police in the area or they are in their own world while driving, but most people get stopped for blatant cell phone use. To this end, officers can usually tell a person is on the phone because they observe the the device in hand, such as when it is held to the ear or if someone is texting at eye level. However, there are other signs troopers look for to recognize a distracted driver. Driving with one hand on the wheel and the other out of sight is a red flag and the most tell-tale sign of texting is someone who is constantly looking up and down. In general, though, a stop will not be made unless the phone is actually visible in hand and if the police officer can see both hands in view, there is usually no reason for a stop based on a cell phone violation. Speakerphone is only permissible when you are using Bluetooth technology or are otherwise hands-free. If a motorist is talking via speakerphone but still has the phone in hand, it qualifies as grounds for a stop. Based on personal experience, a police officer will typically not stop a motorist if he or she believes a person is talking on a hands-free speakerphone, as this is perfectly legal and in good judgement. Distracted driving laws are not specific to cell phones. Holding any type of electronic device while driving, including a GPS, iPod, or camera, also counts as distracted driving under the NY Vehicle and Traffic laws. However, GPS systems can be an exception if they are mounted in the vehicle and not being held in your hand while driving. If you have a GPS device, the surest way to avoid getting a ticket is to leave it mounted while the car is in motion. Under New York State Vehicle and Traffic Law, drivers are not allowed to operate a motor vehicle while wearing more than one earphone attached to an audio device. The theory is that with two earphones plugged in, drivers are unable to hear emergency vehicles and other traffic warnings. Drivers need to have at least one ear free to able to hear traffic noises at all times so if you are using a headset for hands-free speaking, be sure to only have a bud in only one ear. Remember: If we see it, we stop it. The best way to avoid a ticket is to refrain from using a cell phone when in the driver’s seat. However, those who absolutely need to communicate while driving should take advantage of Bluetooth technology or a pair of legal earbuds with the capability to answer and make outgoing calls. In New York, having a cell phone or electronic device in your hand can add 5 points to your drivers license, in addition to fines and any other citation received. Points can lead to increased auto insurance rates and ultimately to a license suspension if you accrue 11 points within 18 months. Stay safe and don’t hold a phone while driving!